More than two dozen employees from Estate Construction Ltd. participate in a new safe male circumcision procedure that doesn’t require men to lose time from work. 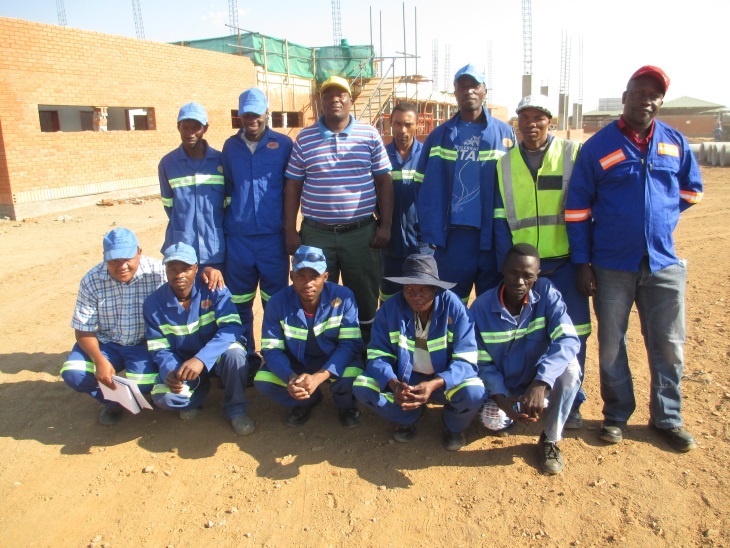 Molepolole, Botswana—A group of men in blue cotton work uniforms with reflective, lime green stripes and baseball caps arrived at the outpatient clinic of Scottish Livingstone Hospital (SLH) in Molepolole, Kweneng East District. They were the first of 25 men who came to the clinic for voluntary medical male circumcision, commonly known in Botswana as safe male circumcision (SMC), during the next few days—an atypical but welcome occurrence in the Government of Botswana’s efforts to reach the population with this proven HIV prevention procedure. What brought the men to the services on that sunny Wednesday morning in September? The workers from Estate Construction Ltd. (Pvt) had learned about the availability of a new method of male circumcision called PrePex.™ It is safe, effective and especially appealing because the procedure requires no time off from work to heal and recover. A nurse had recently visited their company, where the majority of employees are men, to talk about SMC and the use of this new device at a nearby hospital, SLH. Isaac Rasesia, the Safety, Health and Education Officer at the company, was one of the first clients to turn up for the PrePex procedure at SLH and was very pleased with his experience. “Now that I have gone through it [circumcision using PrePex], and I know how it feels, and my colleagues saw that I could carry out all my duties without difficulties, it will be easy to convince the rest of the group to come forth,” he said during a follow-up visit. Rasesia then began successfully mobilizing his co-workers to come for this potentially lifesaving procedure, leading the first group to the clinic in September. Jhpiego, with funding support from the President’s Emergency Plan for AIDS Relief through the U.S. Centers for Disease Control and Prevention, has performed more than 25,000 SMC procedures in the Kweneng region and five other districts over the last two years, in partnership with the Government of Botswana. With the current rollout of the PrePex device, health workers are seeing an increased number of older, working men now seeking SMC, and they ascribe this “breakthrough” to the new innovative device. Both employees and managers approached previously about SMC had fears about loss of production time after the conventional circumcision procedure. With the new PrePex method, clients can go back to work immediately after the device has been placed. There are also other advantages over conventional male circumcision, including no need for injections or sutures and no cutting of the skin—therefore no bleeding. All clients are strongly encouraged to test for HIV, but no one is denied SMC if he refuses testing. Thebeyame Diswai, the SMC Clinic Administrator, explained that in the meeting with Estate Construction, his team clarified that clients would be able to return to work immediately after placement of the device, which would minimize the interruption of company operations. Rasesia went further by taking responsibility to ensure that all his colleagues turned up for checkup visits at the clinic two days after the device was placed, at day seven to remove the device and six weeks after removal to confirm healing. The Ministry of Health’s decision to roll out the PrePex device followed the results of a safety and acceptability clinical study, conducted by the Ministry and other partners at two clinics in Botswana in 2013. The results showed that the procedure was safe and raised high interest among approximately 1,200 men to whom it was offered during the study. In the study, three out of every four eligible men who were educated about it and offered a choice on both methods opted for PrePex. Rosinah Dialwa, Jhpiego’s Monitoring and Evaluation Advisor who analyzed the study data, was not surprised by the response of the construction workers to PrePex. “This is in agreement with the findings of the PrePex study; 74 percent of participants preferred PrePex to conventional surgery and 93 percent of those who were circumcised by PrePex method reported that they would recommend it to a friend/relative,” she said. Amon Marwiro, Jhpiego’s SMC Field Implementation Officer, describes the PrePex device innovation as a potential “game changer,” likely to accelerate uptake of SMC services. “The PrePex device is helping to address some key demand and supply barriers of SMC programming related to conventional circumcision methods,” he said. Rapid scale-up of SMC in Botswana is expected to significantly reduce the spread of HIV, but success of this important public health intervention depends on a multi-sectorial effort. Such an effort requires government, donors, nongovernmental organizations and implementing partners, private sector players like Estate Construction, and, more important, individuals like Rasesia and his colleagues, who are continuing to rise up and act as champions for their own health and for the good of their families and their country.